I wanted to show you what the Postman popped through the letter box today!!! A handmade delight, a be~jewelled thing of beauty sent to me from dogdaisychains. I'm sure you are familar with Jackie's stunning work and if you do not own one of her special piece's then you really are missing out. Not only did she send me this gorgeous handbag but a matching brooch. Harris Tweed and velvet.....a truly sublime mix. She also sent vintage buttons.....bliss and heaven. Now this must look a little odd, but when I left work today, I walked through the local Park back to my car, I spotted this nest on the footpath, which must have blown from a tree. So I popped/stuffed it into my handbag (not Jackie's). I did get a very odd look from a woman sitting on a park bench, but I don't care. The nest really is beautiful and silky soft ... some sort of animal hair has been wonderfully woven. I think it's cat hair! Ugh, some may say but to me it is a magical, scuptural, natural, thing of beauty. My daughter Holly looked heavenward when I retrieved from my bag, when I got home. Small bird, as the little well is only the size of an egg cup. (Pardon the pun). And last but not least, this was sent to me via e mail today....made me smile! 4. Causes you to send it back to the person who sent it to you. DUH! 8. Causes you to hit "SEND" when you should "DELETE." Oh No! Hmmm....Have I already sent this to you? A find, inspirations and some 'makes'. I want to tell you about my 'find of the week'. My local supermarket has a charity shop next door, so whilst popping in for milk and bread, the supermarket that is, I just have to nip into the charity shop, it would be a crime not to? Yes? You agree, good! I noticed the table pictured below for sale in said charity shop and thought what a great height it was, and carried on my merry way. Got home and into my work room and thought about the table.......Telephone's dear husband, who kindly obliged and went and fetched the table for me, complaining that not only did he fetch it, he had to pay for it too;-) (Owls are tooting again)! Anyway, the reason I'm prattling on about this is because I can't tell you what a godsend it has been, mainly because of it's height....it is 6" higher than my work tables and boy does it save the back. It is so good to stand and work at!!! I had the most wonderful surprise the other day, Postman bought me a package from USA. Dear Amy of rosesradishesandrubbish sent me all manner of beautiful items. 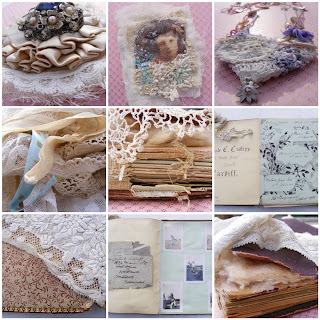 Paper, lace, buttons, a stunning handmade paper heart with my name on it, so many lovely things, but also a piece of her art work. I adore her subtle, quirky, beautiful art, photographs do not capture the fine colour and pencil work and the intricacies of her special style. Thank you so much Amy! I implore you to go and read her lovely blog and visit her Etsy site, you will not be disappointed. After a bit of a 'O so sorry for me' start to last week, I did finally manage to kick myself into some action! After reading a post about a shop window in New York which featured cut paper pigeons on a wire, posted by Sue of mousenotebook whose blog by the way is an absolute delight, a feast for the eyes and so beautifully written!!! You must, must make a visit. I was so inspired, it got me thinking and here is the result! You may have seen my images on Flickr but I wanted to tell you where the inspiration came from. Thank you all so much my lovelies, for all your ongoing kindness and support. Prepare for a small rant! I'm convinced that I have a mischievious Sprite that sits on my shoulder...a naughty little imp whose whole existence is about making my life difficult....what am I talking about? I'm talking about being clumsy! The Sprite goes about dropping, breaking, pushing, falling....you name it I do it! If there is a difficult route round it that's the way I go. I place an item onto a work surface, it invariably rolls or falls off, smashing into a thousand pieces, just as I'm leaving for work. If I can put a finger through a brand new pair of tights...oh yes, straight through. I find it impossible to hold my handbag and a carrier bag and use my key to open the front door, not without dropping my keys or a bag. I think this is probably not the Sprite's fault but because I go at everything like a bull at a gate. Incapable of thinking anything through, so I'm always tripping, ripping, breaking and dropping! The whole point of this little rant is the pic of the Hellebores below. I spotted some snowdrops covered with last years dead Hellebore leaves in my garden today, so in I go with the secateurs to clear away dead leaves, so I can see the beloved snowdrops and what do I do, I manage to cut the beautiful new flowers of the Hellebore too, sheesh! In a way it was a good thing because I took a minute to photograph the exquisite beauty of this lovely flower, that like the snow drop bravely flowers when it's very, very cold. Thanks for all your kind words, the last post seems to have struck a cord with an awful lot of us ..... post Christmas, early spring blues, depressing news...... seems to have a hold in parts of the northern hemisphere. Anyway, I have managed to give myself a good stern talking to and jackie told me to 'get to work', so I have. Onto that in a min. I wanted to show you this first. It's a piece of work I purchased with some old lace. The maker has used a piece of linen with paper tacked onto the front. She (I'm assuming) has used two lengths of a sort of thin ribbon and tacked these lengths into diamond shaped repeat pattern. She has then worked needlelace in the voids of the diamonds. Various patterns are worked and repeated to form the most exquisite length of lace. A real joy to see how this piece was worked. ps:In the quiet of my work room, I can hear an owl outside twit twooing, such a good, countrysidey sound! Hello...... Had a little play with mosaic Flickr toy yesterday. The sun had shone all day and dare I say there was a stirring in the air. The birds song is so clear, strong and beautiful... So I enjoyed taking a few items outside and having a bit of a photo shoot, which was wonderful. I then had a play on Flickr, as you can see. This is a book I have had a very long time, it is a constant source of interest to me....a little faded but hey, it is over 100 years old. (1901). The equivalent of our creative journalling, do you think? Pages filled with photos of happy, young smiling faces, I can't help but feel a little melancholy. Her blouse is luminous and ghostly. One of the pages has these paragraphs of shorthand, at one time I would have been able to decipher but I have long forgotten that language. In between the shorthand is a circle which looks like a circular thumb print but on closer inspection is the Lords Prayer ~ hand written. It is just under half an inch in diameter and absolutely fascinating. I wonder who William Lawson was? I took the photo with my super macro lens and it is still difficult to read! Incredible. I am very lucky and have this week off work, but can I kick myself into crafty action, can I hell! Don't know what on earth is the matter with me. I do tend to get this quite often, it's almost like the fatigue takes over me in a vice like grip. I spend my time at work, dreaming of having time at home to enjoy my studio but, urgh, I feel so lethargic....is it the time of year? Or is it just me? Our eldest, Lucy, lives in London. About two and half hours away from home. She recently moved out of one flat and moved to another. We left visiting her until she had sorted herself out, i.e.what was to come home and what was to be purchased from Ikea by her Dad, and taken to her by us and put together, by Dad! Yesterday we got to see our girl and arrived at her flat around lunch time. After an hour or so of her Dad doing the DIY, we nipped over the road to the thecrown which is a gorgeous Victorian (I think) Pub and Hotel for a bite to eat. Back to the DIY and then after another hour or two reluctantly, left her behind in her new nest and headed back home (breaks my heart everytime, I miss her so much). And just as an extra special treat, a lovely gentleman in a green uniform left us a little note under the windscreen wiper, asking us to cough up £50 or £100 if left for over 2 weeks to Brent County Council! A little bit of a misunderstanding, shall we say, when reading the parking meter, gggrrrrrrrr! Anyway, this was the scene from the M6, as we whizzed home. A gorgeous setting sun over the snow covered countryside. Moving swiftly on..... All things considered this week, I've managed to make three items. I've used little pieces of hand knitted lace and some really beautiful buttons. I'm being very strong and letting go of my button stash! I may need therapy though! Then onto 'Find of the Week'. A book entitled ~ The Miracle of the Human Body. The human body may be a miracle but boy is this book gruesome. There are only a few pics I can show you, ugh! Below is from the Contents Page.......snigger! This is one of the least stomach churning images (when I bought it, I had only flicked through, perhaps I should take a longer look at prospective purchases in the future)! I know I should'nt but this really made be titter. A visual showing the external ears of human and animals to catch sound vibrations. The human character is also a visual for a cauliflower ear. The publishers were obviously running low on funding for a decent illustrator! Snigger again. Last but not least, just look what Helen of cocoaandblankets sent me. What a wonderful surprise and incredibly generous and kind. Fabrics, lace trims, buttons, ephemera all manner of lovely things. Thank you Helen, my life has been so enriched since meeting so many wonderfully kind and generously spirited friends.